Woohoo! HAREWEAR keeps hopping along, helping needy bunnies! HAREWEAR has helped rescue and shelter rabbits and small animals. These poor guys had no hay, veggies, chew toys, hidey holes, meds, and no care info was available. Harewear has offered YOU top quality, attractive clothing to enjoy! While there is now a lot of animal merchandise out there, Harewear offers superior quality, value and variety. 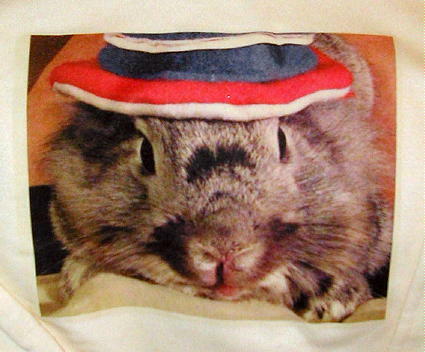 HareWear bunny shirts and totes are great gifts. They are primarily l00% heavy cotton-- comfy, long-lasting, no hassle. Our last order was a surprising success, considering the economy has gone to bunny poop ;-/ We are focusing on practical items: Harewear T's, Totes and Aprons. So, welcome to the "Harewear Discount Sale!" All of the above are 10% off! Aside from the sale items, I have a very few large size totes and a couple sweatshirts available. These are limited, so email me and order early! I cannot offer *all* products unless enough people request them. Then I'm happy to do it. People keep asking if they have a special pet photo, can I put it on a shirt. Remember, I'm no shirt store and require funds so *I* then place an order. Keep your checkbooks (or Paypal from checkbooks) handy! And we've put up some clearance items. Some are l00% perfect, just have no homes; others are select irregulars. Click here for The HAREWEAR CLEARANCE! Over the years, Harewear has amassed a huge variety of designs. See our Rabbit, Cat & Dog, Bird, Small Critters & Wildlife, and Garden graphics. And don't forget to check out the Bunny Nose Gallery just for fun! Click Here to see Simon's life, Murf, and HAREWARE Pottery! Click Here to play Where's Wally? Click to see Oscar's Pizza Bunny Tale. Shirt patterns are updated as new merchandise becomes available. Bookmark us and please check back soon!